See the changes that occurred after the 2010 census and the projections for apportionment changes on the horizon for after the 2020 Census. 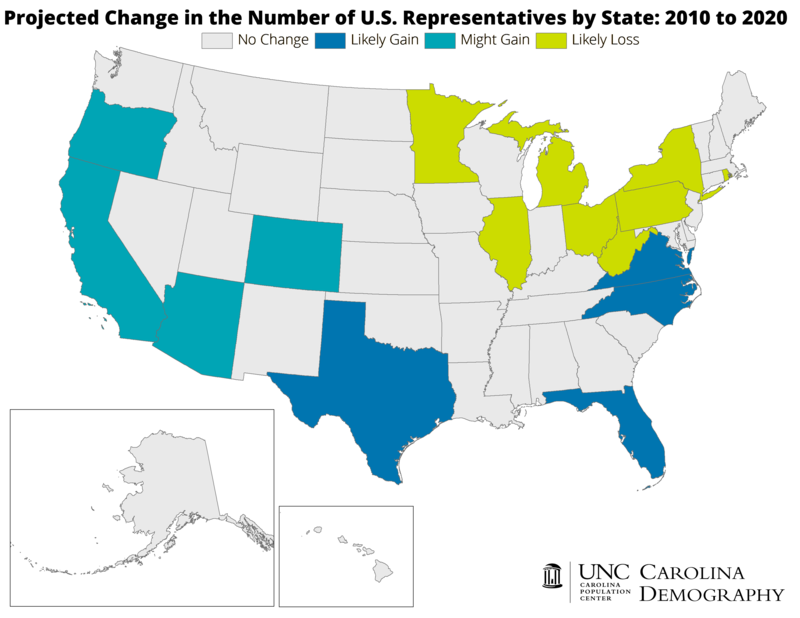 The map above shows the shift in congressional districts between states after the 2010 Census. As mentioned previously, the South and West gained seats while the Northeast and Midwest lost seats. One interesting part of this shift is that it creates a significant change in electoral votes. For instance, the states that President Obama won with in 2008 were 365 electoral votes, but are now only worth 359 electoral votes due to reapportionment after the 2010 Census. This political implication of the post-census reapportionment will heighten the attention directed toward the 2020 Census. Even years before the 2020 Census, many demographers are attempting to predict the reapportionment that it will trigger. While population swings can happen rapidly at times, the consensus is that congressional seats will continue to primarily move to the South and West. Additionally, it looks as though Minnesota will lose a congressional seat, lowering the state's electoral vote total from 10 to 9 (7 Representatives + 2 Senators). This would reduce Minnesota's national influence and challenge the state legislature to divide the state into seven districts instead of eight. See the map below of the other predictions (as of 2015) for reapportionment due to the 2020 Census.